From time to time during the filming of our TV series we come across something totally unexpected. Mostly the unexpected event is caused by Aderman, my trusty videographer. Like the time he dropped his 12-inch knife at the door of an Australian nightclub in full view of the biggest bouncer I’ve ever seen. Or the time in Suriname that we drove 3 hours to film Capuchinbirds only to learn that he left our video camera back at the lodge (next to an empty vodka bottle!). But I digress. Our recent trip to Selva Verde Lodge in Costa Rica was one such trip that held an unexpected surprise. We anticipated filming a show on the Great Green Macaws around Selva Verde Lodge and, having secured pretty good footage of the macaws, we decided to take a white-water rafting trip to search for Sunbitterns. These birds are regarded by many as the Holy Grail of birding in the Neotropics, not necessarily because of their rarity (Sunbitterns are actually fairly widespread) but because of their other unique attributes. Firstly, these birds are stunningly beautiful when they display their open wings. The remiges have brightly-colored webs which, when the wings are fully opened, form striking eye-spots almost reminiscent of bright red and orange sunsets on each wing. Secondly, Sunbitterns belong to a monotypic family, Eurypygidae. There is no other bird even remotely like them but they are classed in the order Gruiformes, along with rails and cranes. * However, morphologically and behaviorally they are perhaps closer to the Kagu of New Caledonia and the Painted Snipes of Africa. A real misfit basically. Kind of like what I was like when I attended school. And lastly, Sunbitterns can be very tough to locate. They are not very social and are wary of a close approach so spotting one requires patience and a knowledge of their habits. Sunbitterns prefer hunting along the edges of fast-flowing, clear streams and tend to immediately retreat to the shade when approached, making a prolonged sighting difficult. I’ve had the same difficulty getting a good sighting of Elvis. But probably the least known aspect of the Sunbittern’s life history is its breeding and nesting. Already a shy bird, the Sunbittern takes secrecy to the next level when it comes to its family life. Few nests of this species have been located, with the majority in overgrown and inaccessible locations. Sunbitterns build an open nest in a tree, generally overhanging a stream or river. The nest is typically constructed with sticks, moss and decaying plant matter. 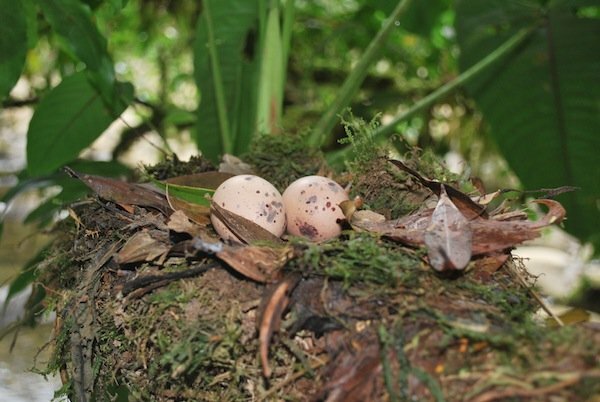 The buffy pink eggs are tended by both parents and when the young birds emerge from the eggs they are almost never left unattended. 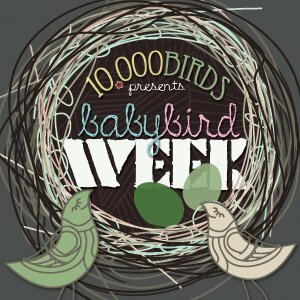 This post originally ran on 14 December 2010 but fit the theme of Baby Bird Week so well that we had to rerun it. *Many now place the Kagu and Sunbittern together in the new order Eurypygiforms. For more info, see #3 on Dave Ringer’s recent post. I enjoyed that particular episode very much- Sunbitterns are such interesting looking birds. 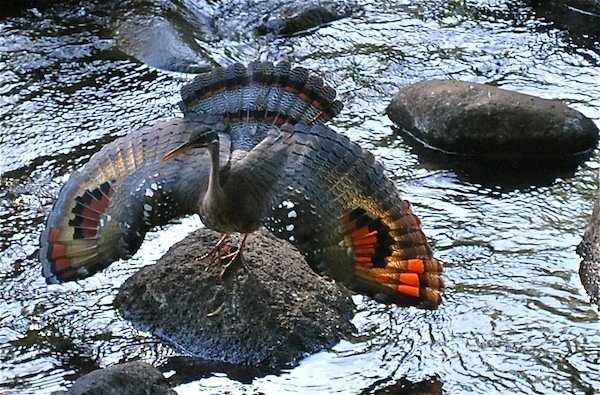 The Sarapiqui River around Selva Verde is the most reliable area for Sunbittern in Costa Rica but they are never guaranteed. Always exciting to see them! Its a great area Pat and I’ll be posting something soon about the other highlight of the area, the Great Green Macaws. Brilliant post – and spectacular footage!!! We were lucky to see two Sunbitterns on the Tuis River earlier this year, but it was nothing compared to what you have shared with us. Again, I have to say – BRILLIANT!!! Thanks Christopher – they are one of my favorite birds for sure. Thanks Christopher – we are shooting all out footage through a Nikon EDG VR scope, the FSA adapter and a Nikon D5100 camera. The results we are getting now are fantastic! If pictures were money that shot with the spread wings and tail would be a winning lottery ticket. And the video is just great too! It is a great shot and I wish I could take credit for it but it was taken by the local guy who found the birds. His name is Cope and he’s a pretty awesome bird artist to boot. Glad you guys are reading each other’s blogs too. I’ve seen oodles of Sunbitterns, but the Kagu eludes me…cheers! I wasn’t aware of this and the taxonomy of this bird is really interesting – thanks Corey for adding the footnote! This is one of the most dazzling videos I’ve ever seen–it takes a lot to make a Sunbittern even MORE interesting than they are. BATV really is where it’s at. Looking forward to the post about the Great Green Macaw! Yes, such a great area for birding, I am looking forward to doing some guiding there in January. Beautiful. I saw Sunbitterns at Selva Verde, but not like this! 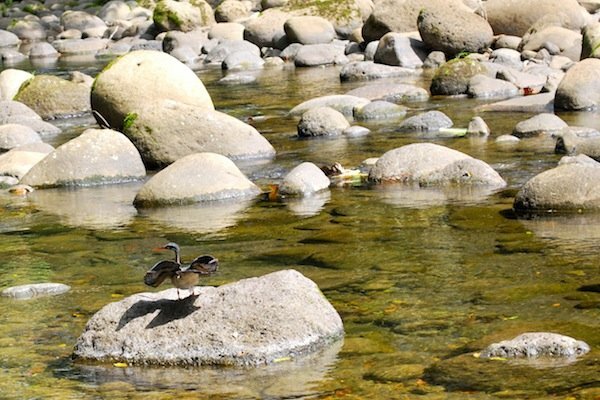 Same looking river rocks, probably same place, but ‘my’ birds refused to spread their wings. Well Done. Great photos and vid. Having spent quite a bit of time following nesting birds, I can’t tell you how exciting this video was for me James. To find an active nest of such a secretive bird, and then to witness it feeding its brood in such perilous conditions, would have sent me right over the edge! The photograph is gorgeous, the video, spellbinding. Fantastic post and stunning video. Congratulations, let me know when you want to come to Ecuador to do something similar we would be very happy to put you up and guide you for free.